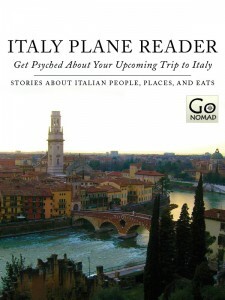 Getting excited about your trip to Italy? The first eBook in the GoNOMAD Plane Reader series provides you with a collection of 31 articles highlighting everything Italy has to offer . . . from Sicily to Torino, from the Adriatic to Tyrrhenian sea, through thousands of years of history, seeing some of the world’s most romantic places, and best of all, the chance to mingle with Italians, who manage to have more fun than any other people on earth.